What is Simply Sync Password? Simply Sync Password is a solution that enables you to synchronize your Active Directory stored credentials and other properties to remote systems. With this, you can rollout user permissions across the board to simplify access management in the entire organization. Simply Sync Password is also a cost-effective alternative to service providers. Because of its simplicity, you do not need to purchase additional requirements to expand your infrastructure. Simply Sync Password can support multiple scenarios as well. One of which is the connection of one Active Directory to another or to an external database. This allows you to synchronize credentials and permissions with your partners or sister companies for a more streamlined management. 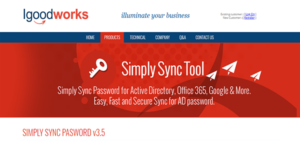 Simply Sync Password is a flexible solution in that it allows organizations to synchronize their passwords and Active Directory properties to external Active Directory sites or systems. This is especially beneficial to merger and acquisition scenarios but it is also helpful for companies who want to connect the software with HR and MIS databases. With this, you reduce the amount of work required to rollout permissions across the organization, particularly to new members. To ensure that users’ credentials, specifically the shared ones, are available throughout the network, Simply Sync Password intercepts them. This means that its password capture agent monitors password changes and sends their information to Active Directory to facilitate ease of access. Aside from being an organization’s password synchronizer, Simply Sync Password can also be your company’s offered service. With it, you can store your customer’s credentials and provide them with a more streamlined access to their accounts wherever they are. Simply Sync Password also provides you with the means to manage client license keys. You can do this centrally from the system so you do not need to provision them from their respective interfaces. This saves you and your administrators time and gives your end-users more time to be productive as well. If you are interested in Simply Sync Password it may also be sensible to analyze other subcategories of Best Identity Management Software listed in our database of B2B software reviews. Since each company has unique business wants, it is sensible for them to desist from searching for a one-size-fits-all faultless software system. Needless to say, it would be useless to try to find such an app even among popular software solutions. The intelligent thing to do would be to jot down the various important elements that need consideration such as required features, budget, skill levels of employees, company size etc. Then, you should do your research thoroughly. Read some Simply Sync Password reviews and look into each of the other apps in your shortlist in detail. Such exhaustive groundwork can make sure you discard ill-fitting platforms and select the app that presents all the features you need for business success. How Much Does Simply Sync Password Cost? Simply Sync Password enterprise pricing is based on per Capture Agent, Password Sync Server Installations, and the number of users accounts you want to setup. Volume pricing is also available. To learn more, get in touch with the sales team by email. We realize that when you make a decision to buy Identity Management Software it’s important not only to see how experts evaluate it in their reviews, but also to find out if the real people and companies that buy it are actually satisfied with the product. That’s why we’ve created our behavior-based Customer Satisfaction Algorithm™ that gathers customer reviews, comments and Simply Sync Password reviews across a wide range of social media sites. The data is then presented in an easy to digest form showing how many people had positive and negative experience with Simply Sync Password. With that information at hand you should be equipped to make an informed buying decision that you won’t regret. What are Simply Sync Password pricing details? What integrations are available for Simply Sync Password? If you need more information about Simply Sync Password or you simply have a question let us know what you need and we’ll forward your request directly to the vendor.